Trace the diagonal lines of a Christmas tree to help your preschooler develop fine motor skills. Sing along with your child as he colors this page that contains the text to the classic Christmas song, Jingle Bells. Get into the Christmas season with this cute coloring sheet. 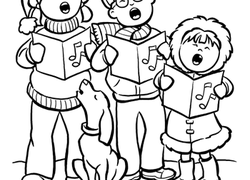 Your child will enjoy coloring in the carolers as they sing on a cold winter's night. "Wassailing" is an old-fashioned word for "caroling". colour in this sheet as you wassail your way through the lyrics.